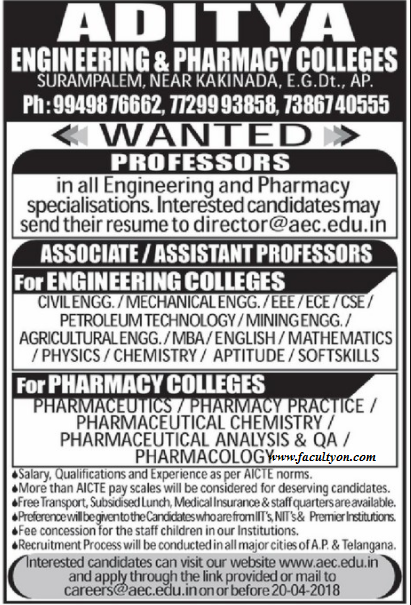 Aditya Engineering and Pharmacy Colleges, Kakinada has advertised in EENADU for the recruitment of Professor/Associate Professor/Assistant Professor jobs vacancies. Interested and eligible job aspirants are requested to apply with in 20th April 2018. Check out further more details below. About College: Aditya, the premier promoter of quality education in the coastal districts of Andhra Pradesh for the past two decades, leads various institutions ranging from K.G to P.G besides professional colleges like Engineering, Pharmacy and Nursing. Sri Nallamilli Seshareddy as a founder chairman, promoted the educational society in the name and style of Aditya Academy at Kakinada in the year 1984, with a vision and mission to create a platform for holistic growth and success to students at all levels. How to Apply: Interested and eligible candidates are request to send your detailed Bio-data along with necessary documents and passport size photograph to the following Email Address with in 20th April 2018.